This weekend's supposed to be the first scorcher of the summer, so I'm going for a two-fer this weekend. No. Get your mind outta Swingtown for a sec. Today is Top of the Rock, Part One. 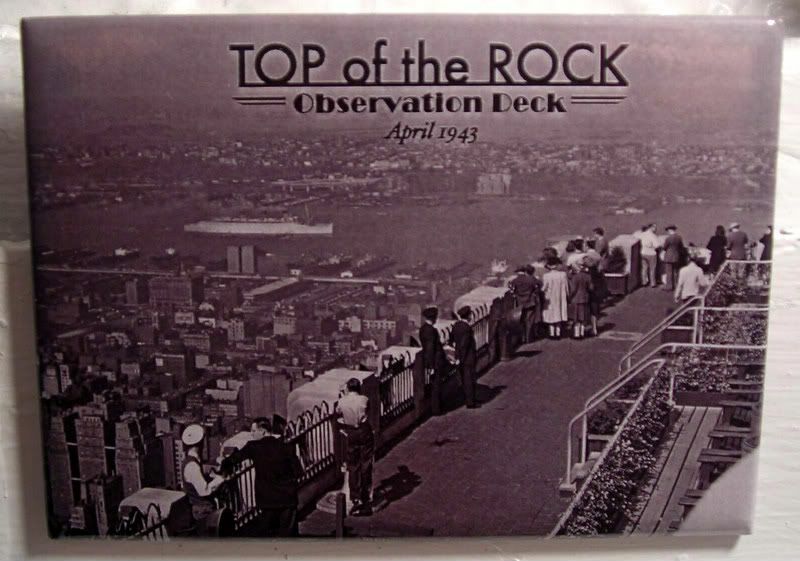 My most favorite place in the city is Top of the Rock, the recently revived observation deck at the top of 30 Rockefeller Center. I love this place soooo much. Let me count the ways. Less of a wait than Empire State Building. Because TotR has only been around these last couple of years, less people know about it. And that means, less of wait, nicer facilities, and less people. I know it's odd, I get superimpatient with crowds, and I live in one of the top destination cities in the world. Just as good a view as ESB. It's true. The view from upper Midtown is just as good, if not better than ESB. And, this way, you can take gorgeous photos of downtown (with ESB in the shot), and of uptown (with Central Park in the shot). Both have amazing art deco detail. Although, ESB edges 30 Rock out a bit - I mean, Doctor Who didn't do a 1930s-centric episode centered on 30 Rockefeller Center. Fab outdoor viewing. What I love about 30 Rock is that it's outdoors, on two different floors. It may not be as high, but here, you really feel like you're at the top of the world and it feels so open and free. When you're at ESB, you feel totally caged in, and in a parapet of sorts. And there's no chance of running into giant mutant gorillas at the Top of the Rock.